Home > News > CRISPR Gene Editing—Poised to Revolutionize Neuroscience? CRISPR Gene Editing—Poised to Revolutionize Neuroscience? The following was adapted from a news story that originally appeared on the Alzforum. By now, neuroscientists are on the scent. Two recent studies reported that the method effectively silences genes within neurons, both in hippocampal slice cultures and within the brains of living mice. CRISPR promises to dramatically speed up the generation of transgenic animals. It also may allow researchers to repair mutations in neural stem cells, and possibly facilitate gene therapy in humans. Researchers have already corrected disease-causing mutations in mouse models of muscular dystrophy and a fatal liver disease. CRISPR studies of neurodegenerative diseases are just starting to ramp up, as researchers are using the new technique to build animal models and develop potential therapies. “CRISPR is a game-changer, and it’s utterly simple to use,” Roger Nicoll of the University of California, San Francisco, told Alzforum. An electrophysiologist who claims to know next to nothing about manipulating genes, Nicoll used CRISPR to delete glutamate receptors in hippocampal neurons, as reported in the September 3 Neuron. “It was the most satisfying, uncomplicated study that I’ve done,” he said. Video credit: Hsu et al., Cell 2014 Jun 5. The acronym CRISPR, for clustered regularly interspaced short palindromic repeats, was first coined in 2002 to describe a phenomenon uncovered by decades of research. Nearly half of all bacterial species and almost all archaeal species whose genomes have been sequenced harbor a curious breed of clustered repeat sequences. These repeats were interspersed between non-repetitive sequences, which later proved to be snippets of genetic material from phages, the viruses that infect bacteria (see Jansen et al., 2002). Eventually, researchers figured out that bacteria had used these non-repetitive sequences as a defense against phage infection. 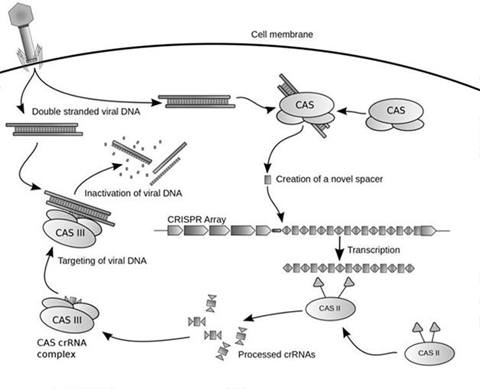 When phages invade, the bacteria transcribe these captured DNA sequences, at which point a bacterial nuclease called Cas9 dices up the transcripts and forms complexes with the pieces. Then the RNA fragments pair up with complementary sequences in the invading phage DNA, whereupon Cas9 exacts a double strand break. As these genomic fractures grow in numbers, they ultimately neutralize the phage. Researchers next learned that they could co-opt this system to silence any gene. After double strand breaks occur, the host naturally repairs them using a process called non-homologous end joining. NHEJ is a haphazard type of repair that adds or removes nucleotides to the target sequence to ligate the broken ends, usually causing a frameshift that renders the gene defunct. Just last year, scientists got the system to work in mammalian cells by transfecting them with appropriate guide RNAs along with the Cas9 gene derived from Streptococcus pyogenes (see Cong et al., 2013, and Mali et al., 2013). Since then, applications have evolved at a blistering pace. Researchers can now use CRISPR to edit or add genes. After transfecting cells with desired “filler” sequences flanked with DNA homologous to the insertion site, cells are coaxed to use homologous recombination, rather than NHEJ, to insert the foreign fillers into the host DNA. Using this more controlled technique, researchers can correct mutations or add new ones, insert reporter sequences, or knock in entire genes. Some researchers even fiddle with gene expression by using the CRISPR complex as a delivery vehicle for transcriptional activators and repressors, rather than as a DNA editor (see Gilbert et al., 2013, and Maeder et al., 2013). The technology eventually will supplant popular gene-editing technologies based on zinc finger and TALEN endonucleases, which are more time-consuming and costly to run than CRISPR, scientists believe. “Right now, it seems that there are no limits to what you can use [CRISPR] for,” Nicoll said. Nicoll jumped aboard the CRISPR bandwagon to knock out glutamate receptors in neurons within hippocampal slice cultures. His lab had previously used the Cre/Lox system to do this. “The limitation there is, you have to make the whole mouse,” he said. This process can take years if more than one mutation or transgene is desired. “Now CRISPR comes along, and you can make multiple mutations simultaneously in about a month or two, the time it takes you to make the constructs,” Nicoll said. Co-first authors Salvatore Incontro and Cedric Asensio cut their teeth on CRISPR by targeting the subunits GluN1 and GluA2 of the NMDAR and AMPAR glutamate receptors that are expressed in excitatory synapses. (These are among the receptors that have been proposed to bind Aβ oligomers and mediate neurotoxic consequences in Alzheimer’s disease.) The researchers coated plasmids containing complementary guide GluN1 and GluA2 RNAs, along with a plasmid containing Cas9, onto gold particles, and blasted them onto hippocampal slice cultures using a gene gun. Every transfected neuron they looked at failed to produce excitatory signals when given the proper stimulus, suggesting that their glutamate receptors were gone. The phenotypes were identical to those seen in Cre/Lox-based subunit knockouts. To learn how scientists use CRISPR to make transgenic animals, and about early forays into neurodegenerative disease research, read Part 2 of this story. Image credit: Taken from Hsu et al., Cell 2014 Jun 5. Efficient, Complete Deletion of Synaptic Proteins using CRISPR. Neuron. 2014 Sep 3; 83(5):1051-7. Epub 2014 Aug 21. CRISPR/Cas9-Mediated Gene Knock-Down in Post-Mitotic Neurons. PLoS One. 2014; 9(8):e105584. Epub 2014 Aug 20.